We’d love your help. Let us know what’s wrong with this preview of The First Time We Saw Him by Matt Mikalatos. Scripture tells us that the words of Jesus made people uncomfortable, confused, angry, repentant, worshipful, and riotous. Today, we read the words of Christ in a steady, even tone and find ourselves wondering if maybe we're missing something. Could it be that we've lost the emotional power of Jesus's words simply because we're too familiar with them? With incredible insig Scripture tells us that the words of Jesus made people uncomfortable, confused, angry, repentant, worshipful, and riotous. Today, we read the words of Christ in a steady, even tone and find ourselves wondering if maybe we're missing something. Could it be that we've lost the emotional power of Jesus's words simply because we're too familiar with them? To ask other readers questions about The First Time We Saw Him, please sign up. An excellent reimagining of some very familiar stories. This book will help you encounter Jesus in a whole new way. Highly recommended! Mikalatos begins The First Time We Saw Him with a disclaimer: "Remember, the point is not to breathe new life into the Scriptures. It's to remind us that they're already alive." And, boy, are they ever! Let me also include a disclaimer: I have been a Christian my entire life. There have been moments that I have "taken off" my WWJD bracelet (or attitude), but there is no possible way for me to separate myself from Christ. I know that. BUT . . . I find that the stories, the parables, can get a bit Mikalatos begins The First Time We Saw Him with a disclaimer: "Remember, the point is not to breathe new life into the Scriptures. It's to remind us that they're already alive." And, boy, are they ever! Let me also include a disclaimer: I have been a Christian my entire life. There have been moments that I have "taken off" my WWJD bracelet (or attitude), but there is no possible way for me to separate myself from Christ. I know that. BUT . . . I find that the stories, the parables, can get a bit stale. I've read them so many times that I feel like I know them by heart. There's a danger then in hearing what they are saying to you . . . or even listening long enough to believe they might have anything to say. The truth is, that I'm exactly the kind of person for whom Mikalatos was writing this book. Awakening to the wonder. That's what so many of us need. Not adding wonder, or uncovering wonder. Awakening to it. Because the wonder is there. It's in every word, and every story Jesus told. Using modern language, names, and situations, Mikalatos retells Jesus' story as recounted in the Gospels. From Jesus' birth to a young girl named "Miryam" ("Mary" in Aramaic), through the miracles and signs and wonders, to his resurrection and ascension, each story comes alive with beauty and wonder. And conviction. Mikalatos writes lovely prose, and he captures the heart of the reader, bringing us in to the story where we eavesdrop on the lessons and can even nearly glimpse the eye of Jesus Himself as He looks deeply into our hearts, piercing our souls with conviction and grace. When needed, he adds his own thoughts and narration. When that will get in the way, he simply lets the retelling of Jesus' story speak for itself. As he is wrapping up this short book, Mikalatos retells the Great Commission. For his purposes, he refers to it perhaps more accurately as "The Great Thing Entrusted to Us," where he suggests Jesus' commission to us is more than that. It's a command and a blessing and a promise and an invitation, all rolled in to one. This was perhaps my favorite chapter in the book. It was the heaviest on author narration, because I think we often misunderstand what Jesus was saying and doing as He stood on the mountain with his closest followers. Where often this message gets bogged down in guilt, Mikalatos reminds us there is no condemnation in Christ Jesus. This isn't an order or a guilt-driven demand. This is an invitation. It's an empowering. It's a gift that we get to share. [The new believers] are watching [Thom], leaning forward, eager to hear what he might say. He smiles and begins another story of what he has heard, what he has seen with his eyes, what he has looked at, and what his hands have touched. And they stay with him until long after dark, gathered around the great light and enveloping warmth of his stories. Mikalatos is talking about Thomas and the missionary work he did following the outpouring of the Holy Spirit. But he could as easily have been describing how I felt about this book--and what we, as believers, are invited to share in our love and spreading of the Gospel. Stories of what we have heard, what we have seen with our eyes, what we have looked at, and what our hands have touched. One last note. When Mikalatos closes the Epilogue, he subtly addresses Communion in one of the most beautiful ways I can imagine. Pete lifts his wine glass. "In his memory," he says, and we toast together, and we drink, and we tell stories long into the night, and there is raucous laughter and there are tears and comforting arms and hymns and on the way home we link arms and hold car doors for one another and there are kisses on cheeks and warm hugs and we tuck into our beds warmed by our memories and, when the sun wakes us, we rise to make another day of memories together with him, here, in the real world, where he lives. This, friends, is our world. The place where we live, and the place where He lives, and the place where we still get to make memories together. Thank you, Matt Mikalatos, for awakening me to the wonder of that gift. Matt gives new perspective on the stories of Jesus by telling them in the guise of the 21st century. These stories are told over and over in Bible studies, sermons, devotionals, commentaries, etc., etc., but Matt makes them sound new and believable, believable in that they make more sense and are all the more unbelievable for making sense. If that makes sense. The First Time We Saw Him is also a great introduction to Jesus for those who don't know these stories. This was definitely such an interesting concept. The gospel stories reimagined in modern day parables. And I think it worked, mostly. Mikalatos starts with the birth of Jesus--Joshua, in this case, and goes until the resurrection and beyond. The stories aren't super changed or anything, just names changed and transported into modern-day. But it did suffice to bring it into a new light. So often, we forget the stories, and how they apply to us. "But we have no Pharisees nowadays, it's not the same This was definitely such an interesting concept. The gospel stories reimagined in modern day parables. And I think it worked, mostly. Mikalatos starts with the birth of Jesus--Joshua, in this case, and goes until the resurrection and beyond. The stories aren't super changed or anything, just names changed and transported into modern-day. But it did suffice to bring it into a new light. So often, we forget the stories, and how they apply to us. "But we have no Pharisees nowadays, it's not the same thing." Well, Mikalatos shows us that it is the same thing. Of course, there are going to be problems when translating Jesus into the modern day. But for what he could do, I think Mikalatos did a good job. 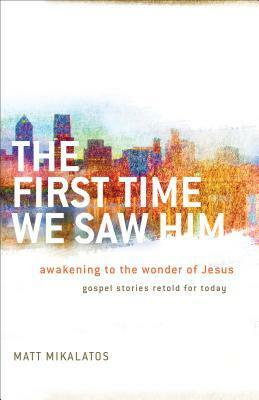 The author's commentary is inserted to help us understand each story, and truly remind us of the wonder of Jesus. Although I wouldn't say this was very challenging, per se. But, I do think that it did what it set out to do, in making us rethink and reawaken to the wonder that is Jesus. So many times in our Christian walk, can we become stale, or not fully understand. But this will open your eyes and bring a new understanding to the gospel stories. I received a copy from the publisher, this did not affect my honest opinion. Matt Mikalatos sets out with a noble goal in his book, The First Time We Saw Him. The intended purpose of the book appeals to understanding the scriptures with fresh eyes, namely, the eyes we once saw them with at the initial point of salvation. In these early months of receiving the gift of faith, we read with veracity, having scales fall off of our eyes due to the cleansing effect of His word upon our souls. While he never goes into an in depth description of what discipleship is, Matt aptly po Matt Mikalatos sets out with a noble goal in his book, The First Time We Saw Him. The intended purpose of the book appeals to understanding the scriptures with fresh eyes, namely, the eyes we once saw them with at the initial point of salvation. In these early months of receiving the gift of faith, we read with veracity, having scales fall off of our eyes due to the cleansing effect of His word upon our souls. While he never goes into an in depth description of what discipleship is, Matt aptly points out that discipleship is not simply a body of information that needs dissemination to new converts. Rather, it is modeling this behavior in light of having the correct information from scripture. Thus, it is akin to Paul saying, “Follow me as I follow Christ.” Orthodoxy meets and informs Orthopraxy. Though we don’t know the principles by which Mikalatos informs his understanding of Orthodoxy – this statement is incredibly solid. His writing is clear and articulates what he desires to within the text. Simply stated, this book is easily accessible to those who have difficulty reading and maintaining focus. However, Matt takes liberty with common parables of scripture by rewriting them. Many convey a similar intended meaning yet ultimately fail to do justice to the text. One specific example is in respect to the parable of the Good Samaritan. However, instead of the Samaritan being a Samaritan, Mikalatos changes the character to a practicing Muslim. Surely, Matt displays the “Good Samaritan-Muslim” as the one who exhibits compassion upon the needy soul as others whom we would expect to act pass by unflinchingly. However, the context of this parable is in reference to salvation. The intended point in this passage is not to diminish a proper understanding of the Law – but that a true understanding of it brings about a heart of compassion. In other words, Matt’s “Muslim Samaritan” is not closer to eternal life, as his beliefs are still damnable. The illustration used asks that if one has poor or false teaching and is still merciful – how might the one who understands what the Law requires reconcile deliberate disobedience to it? While Matt aptly highlights some of the costs associated with following Christ, and respectively, not following Him – one of them is not eternal separation. Beyond this, he treats the cost of following Christ without particular clarity. Part of this is obedience to the scriptures, another, losing one’s life (as Piper so eloquently puts it, “picking up the means of your execution and carrying it to the place of execution). Following Christ requires a large cost – yet not following Christ requires a large debt that cannot be satiated by those who are not in Christ. It is more than missing out on a transformed life – it is missing out on restored fellowship to your Creator and subsequently being damned to eternal punishment. The larger problems in this book are not theological premises, but attitudinal. Namely, Matt never addresses the heart behind one’s lack of desire for scripture and how to read it, nor plainly, the sin in this. What is paraded instead is an appeal to emotion – ultimately implying that there is something wrong with the person who picks up their bible in the morning to be faithful, and doesn’t feel anything when they read it. In other words, when we read the scripture (especially the words of Christ – seemingly, displaying more of the red-letter preference nonsense) we ought to be touched in our hearts every single time. To be clear – I am not saying that one ought not feel anything in the midst of reading scripture. However, I will emphatically argue that being faithful to dive deeply into the recesses of God’s revelation to mankind is not about getting the fuzzy-duzzies. For an excellent treatment of this, read this link. The attitude with which one ought to bring to reading the scriptures is not one of sensationalism, but of desiring to know the Lord and His active plan in redemptive history and how that affects those whom are called. Moreover, ask questions like the following (and more): What do the scriptures teach about the condition of man? In what ways is the gospel applicable to my current situation? In what ways do I need to repent? In what ways can I further understand God, His purpose for the church, and His sanctifying work in my life? In what ways do I need to understand how to share this with others? How does this particular passage fit within its context – and how then does it apply to the church? What does the passage teach is the proper response to the truth I am reading? How then, do I practically respond in obedience to the truth that I am confronted with in order to please God? Overall, I would not recommend this book. Another title I would recommend in its place would be: How to Read the Bible For All Its Worth. Beautiful retelling of the Gospel story. I really struggled with how to rate this book. I am stuck somewhere in-between two and three stars. On the one hand Mikalatos writes with energy and honesty; and he is willing to challenge the passivity of many Christians; I think he is correct to note that far too many have been desensitized to the power of scripture and the story of Jesus, his life, and his message. But in seeking to re-introduce Jesus he mostly just dresses up conventional perspectives and theology in modern language and setti I really struggled with how to rate this book. I am stuck somewhere in-between two and three stars. On the one hand Mikalatos writes with energy and honesty; and he is willing to challenge the passivity of many Christians; I think he is correct to note that far too many have been desensitized to the power of scripture and the story of Jesus, his life, and his message. But in seeking to re-introduce Jesus he mostly just dresses up conventional perspectives and theology in modern language and setting. With a couple of exceptions I don't think his approach presents much of a challenge to current evangelical understandings of Jesus or his message. And this won't come as a surprise to anyone who is familiar with my recent theological obsessions explorations, but the lack of historical/narrative reference or perspective is rather troubling. Mikalatos, like the vast majority of evangelicals, universalizes Jesus to the point of abstraction so that his Jewishness and his connection to his people, culture, and time are nothing more than a setting to be replaced by modern versions so that we might see Jesus in our time and place. As far as these modern re-tellings go, Mikalatos does a fine job. He is after all a writer and story teller. The story of the prostitute who pours expensive perfume on Jesus/Joshua's feet and the story of Lazarus are particularly well done and effectively translate the stories into our modern perspective; our time and place. And they challenge our comfortable judgements about Jesus. I believe this is largely an outgrowth of a focus on Jesus as God to the exclusion of all else. In fact, Jesus as human is barely touched on in these stories except in relation to his dress or social class. Jesus doesn't come of as human in these stories so mach as God made man. The story, again incorrectly in my opinion, is about how the disciples came to understand that Jesus was God and then were confused when he was killed. I simply don't believe this is the story the synoptic gospels tell (John is unique). What also undermines the stories is the completely different historical setting. As Mikalatos leaves out most of the context of the tension filled Jewish desire for independence and the resulting clash with Rome and the equally strong the temptation to make peace with empire when he seeks to move these stories to modern America it comes off key. No where is this more apparent that the stories surrounding his death. It is nearly impossible to transpose the crucification into modern America (and Mikalatos admits this). The answer lies not in universalizing and spiritualizing but in scraping away the abstract theology, and the therapeutic deism, and bad Sunday school stories and getting back to the narrative embedded in scripture. A prophetic and apocalyptic story about coming judgement on Israel and a suffering servant who would give birth to a community that would survive the end of the age and into the age to come. This isn’t the first time I have read a book by Matt Mikalatos. A few years ago, I read The Night of the Living Dead Christian, Mikalatos’s take on the monster novel genre. He humorously used werewolves, vampires, mad scientists, androids and zombies to talk about human sinfulness and our need for spiritual transformation (and its possibility). His first novel, (My) Imaginary Jesus, explored some of the false images of Jesus we Christians present. Mikalatos cast himself as a character in both no This isn’t the first time I have read a book by Matt Mikalatos. A few years ago, I read The Night of the Living Dead Christian, Mikalatos’s take on the monster novel genre. He humorously used werewolves, vampires, mad scientists, androids and zombies to talk about human sinfulness and our need for spiritual transformation (and its possibility). His first novel, (My) Imaginary Jesus, explored some of the false images of Jesus we Christians present. Mikalatos cast himself as a character in both novels. The First Time We Saw Him is not really fiction, but a series of fictionalized retellings of the gospel story with commentary from Mikalatos. Jesus’ life and parables are retold in modern idiom and set in a contemporary American setting. The ‘prodigal son’ goes to Hollywood. The ‘Good Samaritan’ finds a beat up, left for dread truck driver somewhere along the I-5 corridor. Many of the stories about Jesus are not tethered to a particular geographical locale in these narratives. Sometimes I wondered if Jesus lived somewhere near Portland (where Mikalatos lives). Though his death-by-lynching (the closest modern equivalent) may suggest somewhere south east of there. Mikalatos is not a character in these stories, though he does share some of his own story of discovering Jesus as he tells his tales. Beginning with Mary’s annunciation (Miryam) and ending with Jesus’ (Joshua’s) post resurrection appearances and ascension, Mikalatos highlights some favorite stories from Jesus life and teaching. The beauty of this book is it helps us hear Jesus through passages we’ve stopped listening to because we are pretty sure we already know what they mean. Mikalatos helps pull the scales back from our eyes so we see how remarkable Jesus is. Certainly Mikalatos is not the first author to revamp the Jesus story. Beyond Jesus Christ Superstar, there are also some thoughtful books which retell the Jesus story. Notably, Clarence Jordon’s Cotton Patch New Testament casts Jesus as a poor white boy from Valdosta, GA. Joseph Grizone’s series of novels revolve around Joshua (a modern day Jesus). Mikalatos’s own efforts do not attain to the level of ‘great literature’ but it is well written and will give you a new window of Jesus’ life. The crucifixion/lynching scene is gruesome and heart-rending. The post resurrection account retains the magic. There is still a sense of Jesus being lost in translation. The gospel accounts make allusions to God’s larger story. Placing Jesus in somewhere-in-America removes his particular character and life. This is where Mikalatos own comments and encouragement to explore the Jesus story yourself remain important. I give this book four stars. This is a book for those who perhaps know the Bible 'too well'. For those that grew up hearing the stories of Jesus and the gospels, we begin to take a 'been there, read that' attitude towards the scriptures. The emotions, the tension, the drama of the life and stories of Jesus are lost on us. Mikalatos works to re-tell the stories of Jesus in the gospels that evokes the same kinds of emotions that they were written to create. This is in no way an exegetical study of the passages--in fact, in mo This is a book for those who perhaps know the Bible 'too well'. For those that grew up hearing the stories of Jesus and the gospels, we begin to take a 'been there, read that' attitude towards the scriptures. The emotions, the tension, the drama of the life and stories of Jesus are lost on us. Mikalatos works to re-tell the stories of Jesus in the gospels that evokes the same kinds of emotions that they were written to create. This is in no way an exegetical study of the passages--in fact, in most cases he never explicitly states what passages he's pulling from. Mikalatos is working to give you a homiletical commentary on the stories we know so well; to cause you to cry, be confused, infuriated, and feel the range of emotions that are intended to be there. I set in knowing that this was going to be a quick read and knowing the strategy he was working with; but I found myself not able to academically stand aloof. I was struck by many of the stories. Reading through this, I was looking to name which story was particularly well done, and found it hard to choose. However, I think his rendition of the story of the prodigal son is the best I have read. And of course when it came to the death of Jesus, I was moved to tears and renewed thankfulness for what Jesus has done for me. This book took me completely by surprise! I actually had not expected to review it but due to a happy accident, I got the chance and I am thrilled to say that it is a wonderful book that everyone should read! Matt Mikalatos asks us to take a step back and look at our faith from a different perspective – to look at God from a new perspective. How many of us have a skewed view of God? How many of us feel detached from God because we just don’t feel a connection with him? Matt points out that those of This book took me completely by surprise! I actually had not expected to review it but due to a happy accident, I got the chance and I am thrilled to say that it is a wonderful book that everyone should read! Matt points out that those of us who grew up in church, mostly learned the same lessons, heard the same Bible stories, memorized the same Bible verses and that has shaped our faith. In many cases, like his own, this gives a somewhat flat and skewed view of Jesus and his amazing miracles, God and his love for us and the Spirit He sent us to be a constant companion. In The First Time We Saw Him, Matt shows us the Bible stories we all know and love but with a very unique spin. Why didn’t someone think of this before? This book has had an impact on me that I have never experienced from any other book (except the actual Bible of course) I’ve read on the subject! Will it give you a renewed faith and help you to develop a relationship with God? I truly hope so! “Gospel stories retold for today,” a tag line that certainly grabbed my attention. One, because I am a fan of Francine Rivers and Liz Curtis Higgs, who have retold Bible stories with great skill. I knew this book could be great or truly terrible. Especially if the Gospel got lost in the modern retelling. However, to my surprise, this book is quite amazing. I am the prime example of the person who grew up in church and vacation Bible school, in the cinder block basement rooms of Baptist Churches. “Gospel stories retold for today,” a tag line that certainly grabbed my attention. One, because I am a fan of Francine Rivers and Liz Curtis Higgs, who have retold Bible stories with great skill. I knew this book could be great or truly terrible. Especially if the Gospel got lost in the modern retelling. However, to my surprise, this book is quite amazing. I am the prime example of the person who grew up in church and vacation Bible school, in the cinder block basement rooms of Baptist Churches. I dare say there is a Bible story I haven’t heard at least 100 times. Author Mike Mikalatos managed to retell the Gospel story in such a way that it challenged and unsettled my heart. The First Time We Saw Him, left me hungry and desperate to go back and read these astonishing accounts in scripture with new eyes. More importantly, after reading the first few chapters, I leaped into action to help a neighbor I had been avoiding helping for several years. I know…a shameful admission, but its true. Mikalatos retelling of the Good Samaritan was eye-opening to my own failings to reach out to those who might slow me down during my “too busy for interruptions,” day. As always, Matt Mikalatos writes a compelling and readable book that keeps you wanting more. Good thing I'm about two books behind reading his published books or I'd have nothing to look forward to! Well, a few books to look forward to, but not a Matt book. However, if you haven't tried a Mikalatos book, hopefully this shiny review will make you run out and get one or find an e-book to buy. This book is the story of Jesus told as if it had happened in modern time. It's fun, its exciting, its tra As always, Matt Mikalatos writes a compelling and readable book that keeps you wanting more. Good thing I'm about two books behind reading his published books or I'd have nothing to look forward to! Well, a few books to look forward to, but not a Matt book. However, if you haven't tried a Mikalatos book, hopefully this shiny review will make you run out and get one or find an e-book to buy. This book is the story of Jesus told as if it had happened in modern time. It's fun, its exciting, its tragic but it has the ultimate happy ending....hopefully for more then just the people in the stories but for the reader too. The stories retold in this book will feel like nothing new to most "seasoned" Christians especially those who are lucky enough to go to a church that tries to deeply understand the message of the Bible. Despite the fact that none of the retellings in this book felt new or radical to me, the book made me step back and evaluate my life and where I want to go which is a great thing! This book is a great refocusing tool for everybody, but especially new or struggling Christians. This was a First-Reads book that I received to review. I didn't not like the book, I thought it was a very interesting take on the gospel, but I don't think that the gospel needs retelling. I think the gospel needs to stay the gospel. I like the fact the the author discussed where his version came from by citing scripture, but I still think trying to put Jesus in the modern world is not something that should be done. It loses something in the translation. Simply wonderful. Matt retells old gospel stories with such crisp writing and provocative narrative that refreshes the original stories in neat ways. As Matt says in the intro: “What if we could find a way to make [the stories] all real to us again?… the point is not to breathe new life into the Scriptures. It’s to remind us that they're already alive." Well done, Matt. Well done. I give this book three stars. I am stingy with them or at least I am becoming more and more so. I like it and it is helpful to a point. And that point in my estimation was three stars. The whole book can be summed up it like this: it is like if... This is how he handles the gospel text to try and help illuminate it for the modern reader. I will post a full review soon. This book does exactly what it says- You feel like you meet Jesus for the first time, today in the 21st century. It's a new lens to understand the serious and graveness of what Jesus did. He was a revolutionary, but of love and not war. Highly recommend... Refreshing, well written, and a quality gut check book.